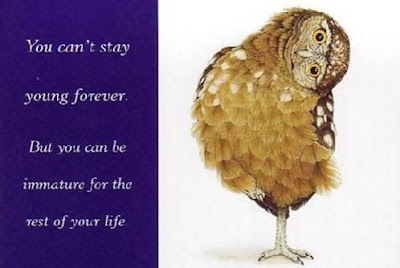 A little giggle to usher out 2009 and welcome Twenty-Ten! 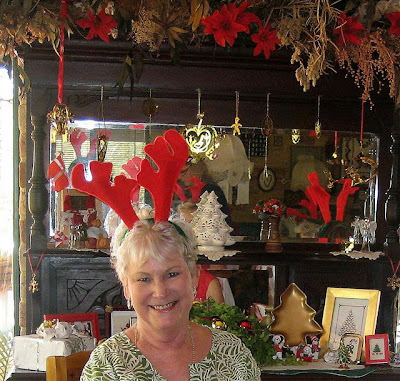 Thanks for your help, Joy and Happy New Year to you, too, Prue! 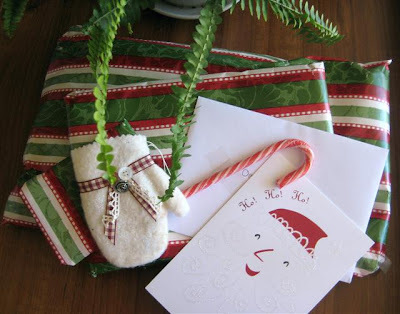 I have received very beautiful gifts this Christmas, so I will close off this year by showing you some more! 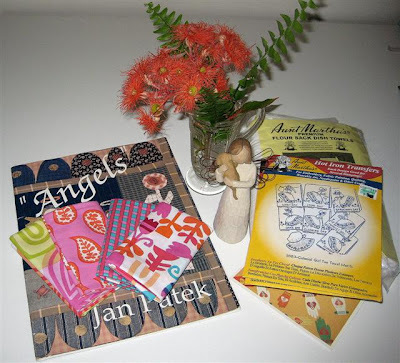 Julia's Place a gorgeous Friendship Angel with her puppy over her shoulder, and then from Darlene of Quilting Daze, flour sack dishcloths and embroidery transfers - Dear Friends, I love them all, thanks! Kathie and I were having a mini-panic, slack postie here, but at last her gift arrived in yesterday's mail. I will be so pleased when all is back to normal after the Festive Season - lots of businesses have just closed, they will re-open again sometime and then with our 3-hour difference between the east coast, a lot of little things we take for granted cannot be accomplished - oh, no I'm not whingeing, wouldn't do that, lol! To everyone, I wish you a wonderful 2010, blessings and happiness! I'm on a mission! It may seem like creating UFO's to you, but I really will try to finish. 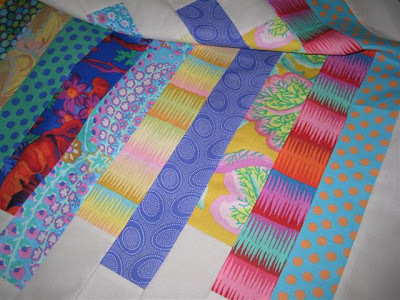 I have used Quilt Lite as a batting for the little sneak-peek below and am big-stitch hand-quilting with Perle thread - I'm using my Hera Marker to rule quilting lines and go into Seventh Heaven with each stitch! The floral fabric in the middle - I love - a Philip Jacobs and I've ordered more - only 3 yards and I feel maybe I should have bought 10! Another sneak-peek and yes, Kaffe again! 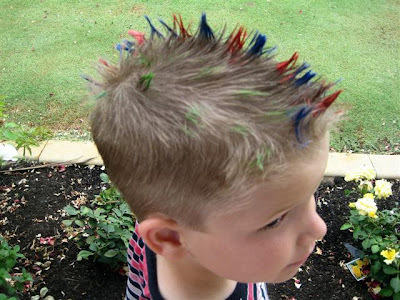 This is for a baby boy, modern style! 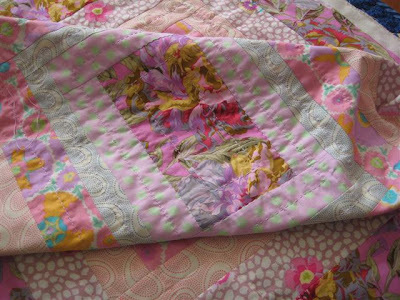 Good friend Myra from Tactile Pleasures in Fabric sent this gorgeous PIF to me - so much talent and love! Thanks, Myra - we used the runner on Christmas Night, placed on the kitchen bench to serve up the goodies that we ate outside, it was such a beautiful night! 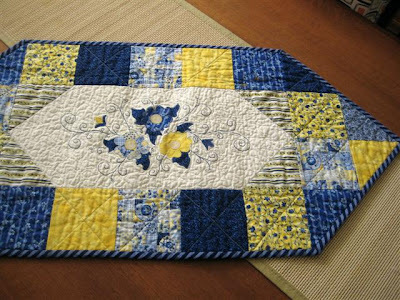 DD Angela seemed to think she would score this runner as the colours would be perfect for her home - sorry Darling, not this one! 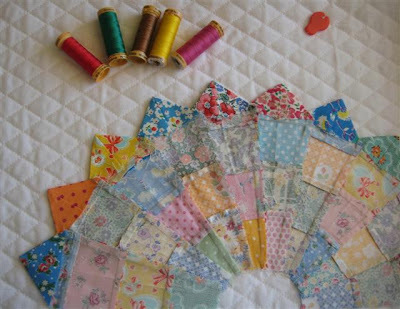 I have yet to finish and parcel up my PIF's - I'm going to be wicked and make them my first finishes for 2010 - oh, I have a couple done, so I guess I can't really count them! I have cleaned out my Inbox and I so enjoyed all the Christmas Greetings - again for 2010 another resolution, to respond immediately to all my Comments! I have only 4 more days to make resolutions, so much garbage to put behind me and so much effort to make the lifestyle changes that are necessary! Happy Day! It has been one of the most enjoyable Christmas Days I have had - so much peace and goodwill shared by us all! I could write a little book about it all - I'm sure most of us could do that! 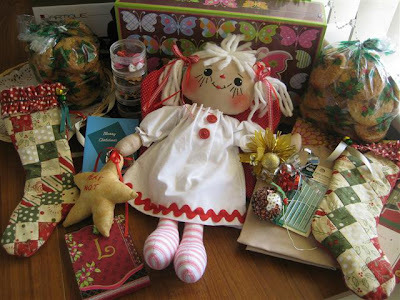 Such wonderful gifts with so much love and thought put into them - this little angel came to me from Caryn at Pieceful Chaos - when I opened this parcel, I was so thrilled all I could do was stare at her! I have always loved dollies as most of you know and it is such a joy to feel my heart give a little leap - later in the day I said to Heidi 'you can look, but do not touch!' - Heidi gave a shocked little smile! Hey, Chookyblue ... what do think about this, Gorgeous Girl? 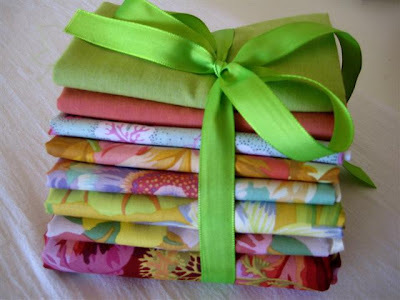 So many beautiful gifts, so much joy to share, there were 16 of us for dinner at my place yesterday evening, so there's one tired little old stitcher today and that's exactly what I am going to do! To all my Friends and Followers, may the Festive Season be peaceful and wonderful! For some time now, I have been wanting to thank New Followers and All Visitors! This is the perfect time! I have tried to upload a snappy little greeting - it was not to be! 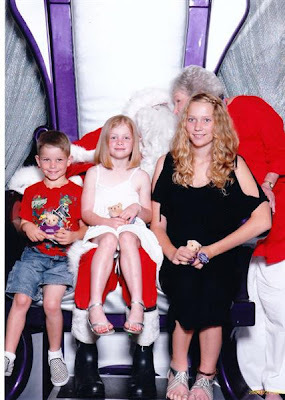 So here we are, Byron, Heidi and Ayesha saying Happy Christmas while Nanny kissed Santa Claus! 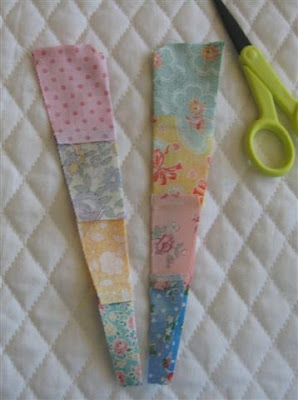 A little sneak peek at what I am working on - only the binding to be done! My dearly beloved scissors turned up in the cutlery drawer - Oh, I think I told you that! Here they are, another pair engraved and the lovely fob 'be yourself' from Caryn! 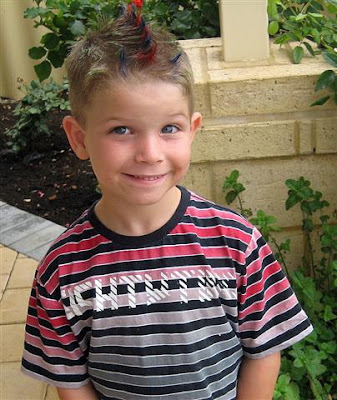 Who else but Byron - fresh from the hairdresser and of course had to show his coiffure off to Nanny! Two of my friends, namely the above and his sister, went to Ikea yesterday - not the ideal place for children, but they wanted to visit the playroom, of course eat and drink in the cafe and then proceed to maraude the customers with their shopping trolleys. We were about to turn the corner to their home and a little voice piped up 'I hope they aren't at home!' - why? - 'then we get to sleep at your house, Nanny'! The Pied Piper and her children plus one are off to Garden City to see Santa today, then for a consult with an orthopod up that way! Is this spreading the goodwill too far? The postie has brought me gifts from the USA again - from Darlene and Myra - oh, what fun! thank you both so much and I'm using a lot of self-discipline to leave them nicely in their packages. 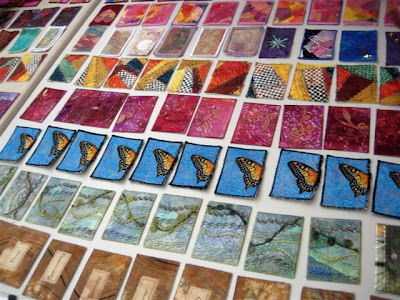 I'm off to prepare for the onslaught - hope your days are all happy and quite organized - perhaps even with a little time for stitching! Whoohoo! 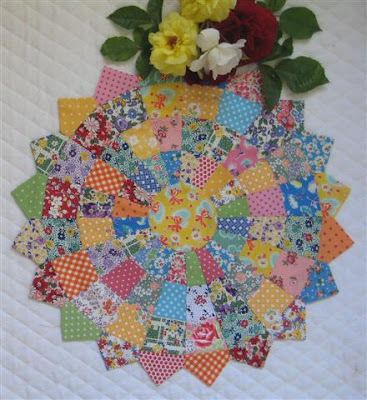 New fabrics by Kaffe from a new website Calico & Ivy - a fabulous quilt shop, Please have a little visit to see the great new website and see the wonderful variety we are fortunate enough to have here in Perth! Yes, I am peaceful midst all the Christmas frenzy. I had a super day yesterday, firstly visited a great new dentist, Fleur - all good news there - then went to have an x-ray, walked straight in picked up a mag and started to browse, my name was called and I was all over and done with in 15 minutes, so decided to take a drive so I would have lots and lots of fabric to do what I want to do, SEW! 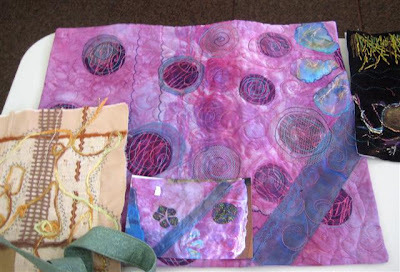 This is in 'My Studio' all sorted and ready to stitch, but not on the agenda for today. 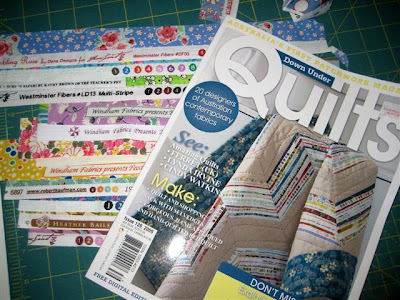 I think Down Under Quilts has once again produced an exciting magazine - it seems to get better and better! 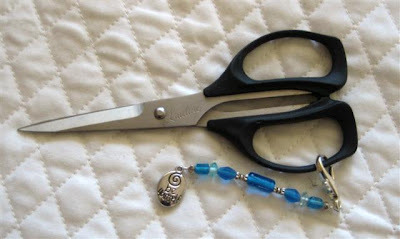 and a delightful little beaded scissor-keeper? from my SSCS, Caryn of Pieceful Chaos!It tells me 'be yourself' and to me that is a very significant message for me at the place where I am within myself! For this, thanks, Caryn, all organized by Chookyblue ... - Gorgeous Girls! 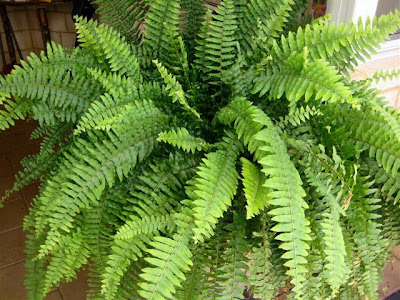 This is me - I love ferns! To you all - a message for every day of the year. Enjoy love, joy and peace, make sure you share it ! Happy Christmas, Girlfriends! Thank you for sharing such a lovely day - precious moments! Wow! What a day - 5am start and a late evening. We are all so fortunate to have each other - lots of hugs and fun and being there for each other! 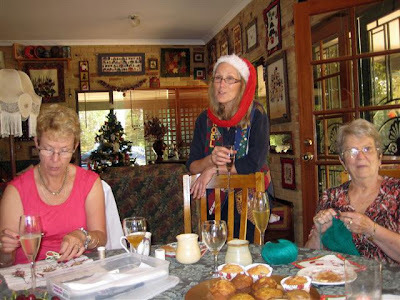 How wonderful is Gwen, chatting and enjoying her bubbly while Barb and Teena stitch! 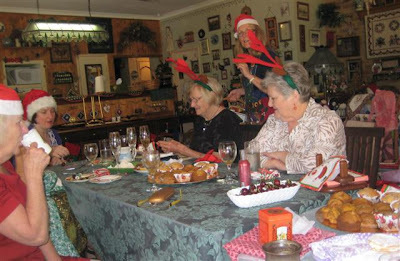 Gwen's home thrills us all - the best place to have our Christmas gathering! How gorgeous is this - a gift to Gwen from her Boyfriend! 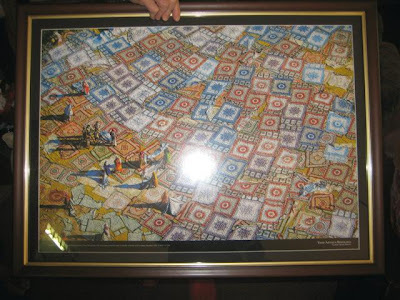 It is a shame the flash has reflected in the glass of this great print - Indian women who have displayed their textiles. It was so wonderful to welcome Jan of Gallivantour back home - for 5 weeks only and then she and Bill will resume their wonderful travels around Australia! 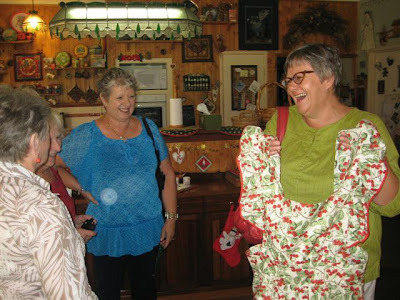 Jan's in the blue and Kris is showing her lovely apron, a gift from another Jan! 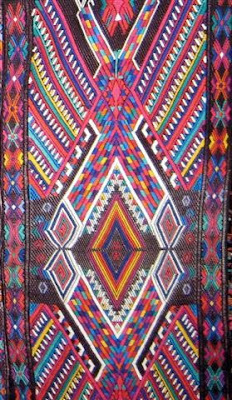 Gwen has just returned from a wonderful trip taking in Gutemala - fabulous traditional fabric! 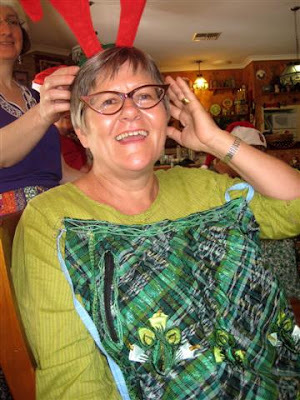 Kris is showing us another lovely apron - a gift from Gwen, another wonderful fabric from Guatemala! A toast to us all! Robin opening her Santa Swap and Shari of Mumsyblossom's World, back left! I hope you can enjoy the spirit and the bubbles! Lots more pics - we'll see what the next few days bring - until then, Happy Day! That is how long since I have Posted and a lot has happened in those days - mostly all good! There has been little time for blogging and browsing and that's sad, lol! 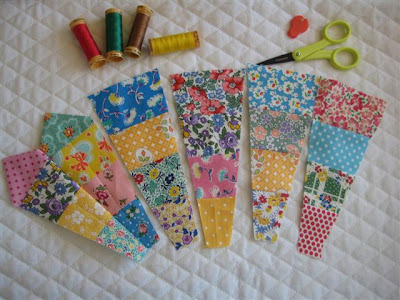 There's been absolutely no sewing - now what could be sadder? 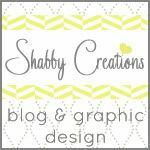 Hi Caryn of Pieceful Chaos, New Jersey, USA! 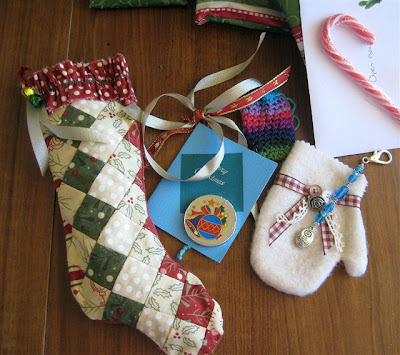 Your SSCS gifts arrived safely a few days ago and I have left it until a peaceful Sunday morning to open the package - I am so thrilled and really don't want to wait until the 25th, but will - I have a feeling I will love the gifts! Our gorgeous Chookyblue .... so much love and thanks to you, too! 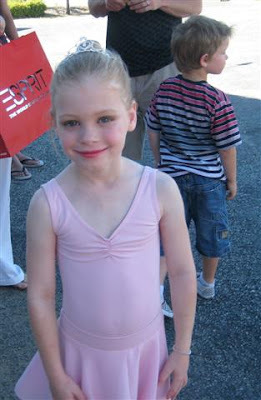 Yesterday was Heidi's day - her ballet recital! We are all so proud of her - her tutu has been shed and I have no pics of her dancing as photography was not allowed! There will be more to come, I hope! Last Friday I had the good fortune to be welcomed to the Contemporary Group, part of our state guild's organization, WAQA. It was a truly enjoyable day, very enlightening, a lovely venue , the best part was the wonderful hospitality shown by all the girls! 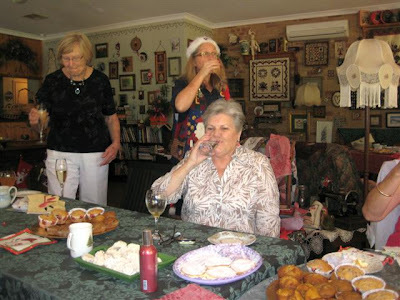 Next Tuesday is a very special day for me - our Christmas gathering with Girlfriends! 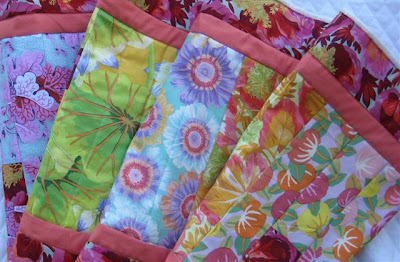 Ooooh, it is so exciting - we will get to catch up with Jan of Gallivantour and also Shari of Mumsyblossom's World! I am a very happy girl today, I know life in general has hills and valleys for us all - today I feel truly blessed! As promised, here is my Dresden Plate made from Kaffe fabrics, using a Dresden Wedge Ruler that I had custom-made from perspex and measures 8.5" along the middle line. This plate measures approx 19" across the diameter, measuring outer tip to outer tip. 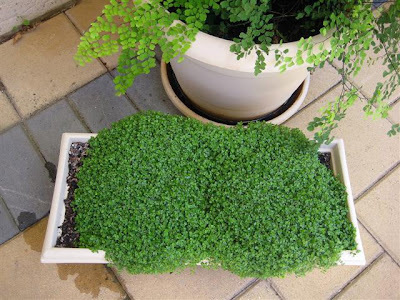 I really love it and I am very happy with it, however here in Australia, I think it may be difficult to get a Dresden wedge that measures longer than 8" along the middle line. 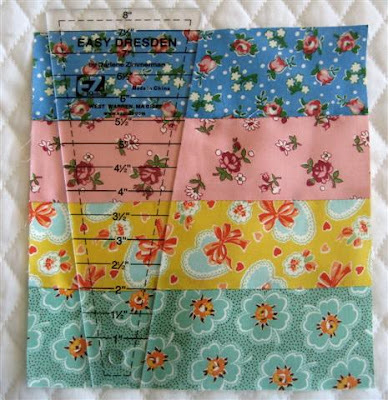 I had wonderful thoughts of using 2.5" pre-cut Jelly Roll Strips and to achieve accuracy the wedge has to be 8.5"! So here it is made with my Dresden Wedge Ruler that I had custom made! Here are the instructions for making a Dresden Plate, using a commercially available 8" wedge - I have been able to find EZ and Matilda's Own. 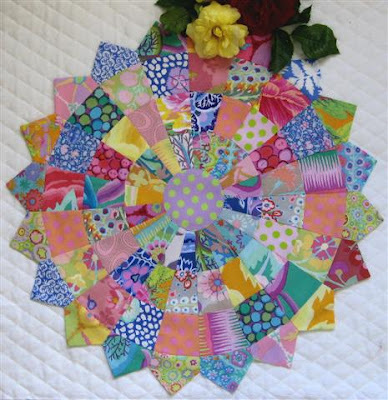 The diameter is approx 17" - all seam allowances are 1/4" - enjoy! 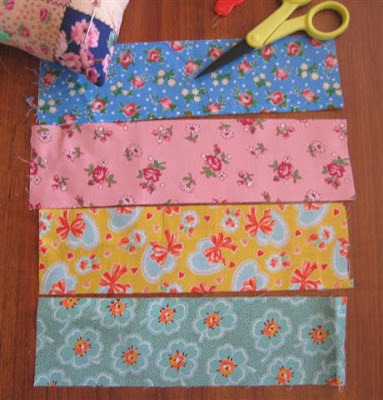 Cut 4 strips of fabric 2.25" wide - this can be made from scrap pieces, fat quarters, or width of fabric - maybe the more you use the more interesting the plate becomes - try for 20 co-ordinating fabrics minimum, though 10 would do! 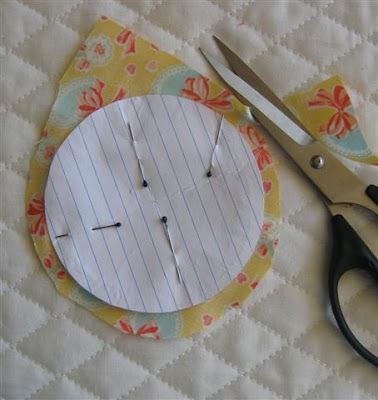 Sew the fabrics together, place your ruler at the 7.5" line and cut with a rotary cutter. 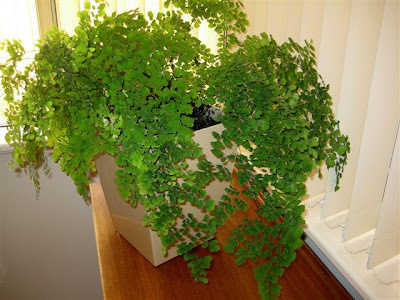 You will notice the ruler can be topped and tailed. You will also notice how I have pressed the seams in opposite directions so they will interlock nicely when sewn together. 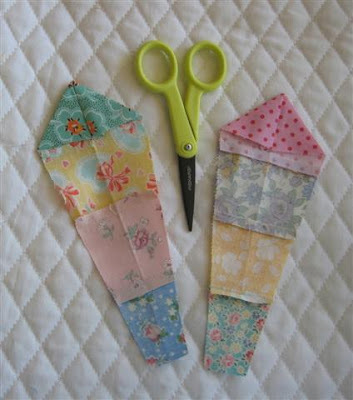 Now, fold each wedge of 4 fabrics in half and sew a seam across the top, double stitching and clipping the corner. This will help to make a nice, sharp point. Fold top down with seam in line with the middle line made by the iron, and this makes a nice point using bluntish scissors, skewer or knitting needle to poke the point out nicely. 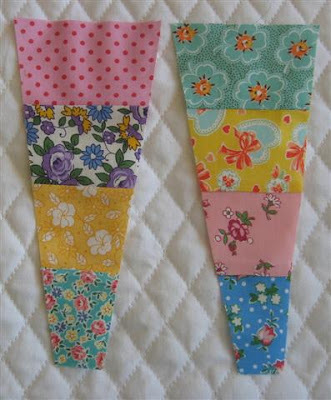 Sew wedges together, say in 4 lots of 5, and you will have 20 wedges total! 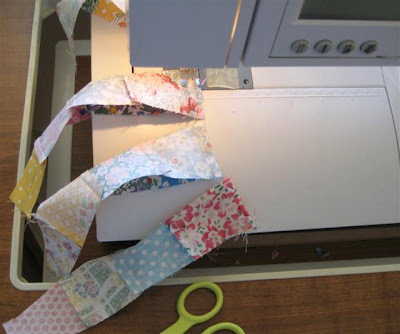 Chain piecing can be used! Whew - half way there! How are you going? Press the seams on the back all in the one direction - you will notice how all seams have nestled into each other and the half plate is sitting flat. 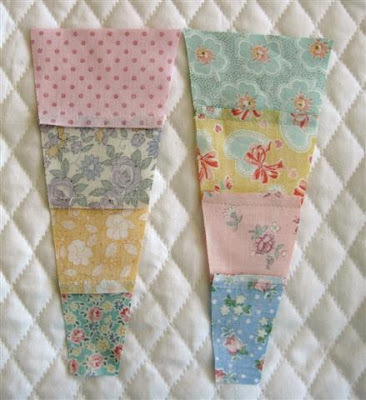 Make another half in this manner and sew both halves together! Okay, so now your full plate is made and all seams pressed in the one direction on the back! Make your centrepiece with a 3.5" diameter piece of light cardboard, leaving 1/4" seam allowance all around! 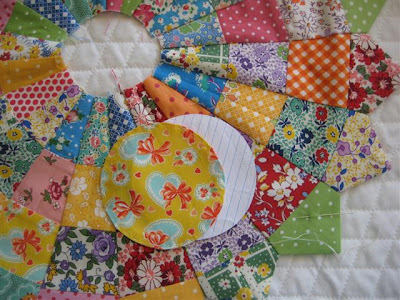 Hand-sew a running thread around the circumference and draw the thread into a gather to fit snugly around the circle! Use a little spray starch to press nicely, then pop the cardboard out of the centrepiece, tack around the edge and sew with tiny blind stitches around the centrepiece, attaching it securely to the wedges! 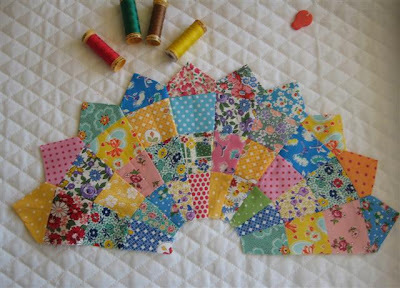 I do hope this is a helpful tutorial - the patterns for both blocks are my own! 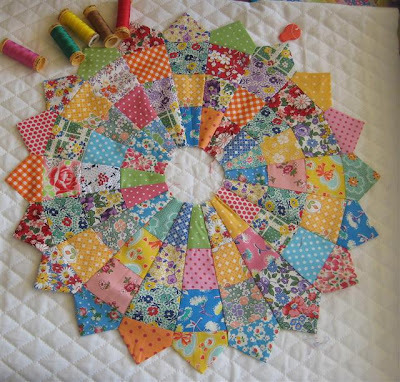 It is after 10pm our time - it has been a busy day, so I would love to have your feedback - please contact me if I have omitted anything or given incorrect information - it has been a buzz to do this tutorial and I intend trialling smaller blocks - all would make a nice quilt or cushion cover! There are quite a few other tips that will be useful, but best leave them for another time - hope you aren't yawning and over it! Oh, to finish up and into bed after a very hot summer's day - it is lovely and cool tonight - to read an interesting book will be just lovely!